Need extra green space...when how about looking up? Directly up, above our heads there is a zone with plenty of space, air, moisture, light and general appeal that can be integrated with nature and infrastructure. Design Boom shares with us Greenspotlight. 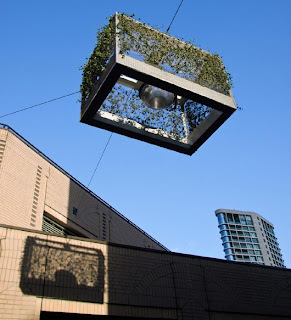 It is a public light with living plants that were woven into a frame. The public street light provides an ample amount of lighting, the frame provides protection from mother nature's forces (shade, wind, rain, etc.) There is also a ring of integrated planters on the bottom, which helps to combine the light with the greenery. This is exactly the type of outside-in thinking and approach that cities need to adopt. Too often we are trying to fix old ordinances, updates codes, file for more grants, and increase taxes. What about adopting new design practices and utilizing local artists and design minds that work with existing infrastructure and improve the city? Why do we need meeting consensus and voting on issues that are so tiny when we can make big changes by looking outside the box? Why are we so stuck in our ways when it comes to municipalities and organization? My vote this week is for Greenspotlight. A brilliant sustaino idea!